Our mission at Faith United Church of Christ is to use our varied gifts to know God and make God known. Lending a helping hand and sharing our blessings with one another makes the presence of God real and strengthens our own church community of believers. Together we can reach out to larger missions and show God’s love on even greater levels. At Faith, we have a CD ministry for those church family members who can not get to sanctuary for worship but can stay connected by listening to the service in their own homes. We also have a freezer ministry for those who need a meal (casserole, container of soup) for any number of reasons. We have people volunteer to prepare these meals and they are delivered with a pastoral call. From reaching out to one another we also reach out farther to sponsor two children through Global Ministries. Throughout the year Faith’s mission includes support for our community’s food bank, Bethany Home, Phoebe Home and Neighbors in Need. A favorite mission is Blanket Sunday. We pledge annually to Our Churches Wider Mission and many other charitable causes. 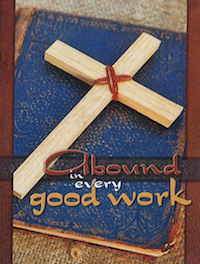 Coming together in one body gives each of us a greater strength to do wonderful work for the lord. He calls us into his church to accept the cost and joy of discipleship, and to be his servants in the service of men. Come, be a partner in the work of our Lord. Be part of Mission at Faith UCC. Look inside to see what you might have an interest in!